Includes New Super Mario Bros. 2, Pokemon Sun, Luigi's Mansion and more! 100% Authentic Nintendo versions. Also Compatible With : Nintendo 3DS, 2DS, 3DS XL and the New 3DS XL systems. Nintendo DS & Nintendo 3DS Game Lot. Condition is Very Good. Shipped with USPS First Class Package. Includes Mario Kart 7, Luigi's Mansion, Scribblenauts, Pilotwings, Angry Birds, and more! 100% Authentic Nintendo versions. Also Compatible With : Nintendo 3DS, 2DS, 3DS XL and the New 3DS XL systems. No games included. No games included. No games included. I repeat this because many will still buy case and manual listings thinking that they are getting a steal of a deal on a game that goes for much more. There is no games included. This is for cases and manuals only. Goosebumps, brain age, and Mario party do not have manuals(Mario party never came with one). Bravely Second : End Layer. The Legend Of Zelda : A Link Between Worlds. Animal Crossing : New Leaf. Harvest Moon : The Tale Of Two Towns. Most of the cases are in mint condition, the couple that are not, are acceptable. 3ds games lot - super Mario 3d world, zelda albw, luigis mansion dark moon, . Condition is Brand New. Shipped with USPS First Class Package. nintendo 3ds 3 games lot. Condition is Good. Shipped with USPS First Class Package. These cases are mint I see no problems. Lot of Pokémon Cases Only No Games (Nintendo 3DS, 2014). Condition is Very Good.Titles include: Pokémon Sun, Pokémon Moon, Pokémon Omega Ruby, and, Pokémon Alpha Sapphire. Lot of 10 Miscellaneous Nintendo 3DS Games LEGO WWE ANGRY BIRDS TRANSFORMERS. Condition is Good. Shipped with USPS Media Mail. Pokemon X and Y Nintendo 3DS Game Lot with Original Cases. Games are in very good shape and have been in a smoke-free environment. Nintendo 3DS Games - Lot of 3 . Condition is Like New. Shipped with USPS First Class Package. nintendo 3ds games, No Cases Games Only. Condition is Very Good. Shipped with USPS First Class Package. 11 games. Game titles are: Xeno Blade Chronicle, Super Smash Bros, Code Name S.T.E.A.M, Are You Smarter Than A 5th Grader, Chibi Robo Zip Lash, Dinosaurs 3D Combat Of Giant's, Steel Diver, Lego Pirates Of Caribbean, Little Battlers Experience, Cut The Rope Tripple Treat, Snoopys Grand Adventure. Tested and working. May show slight wear from use. No original boxes are included. Ultra Moon. 16 Nontendo DS Games, Lot Woth Case To Carry Them. 3DS. Condition is Very Good. Shipped with USPS First Class Package. Legends of OZ Dorothy Reborn. Used and tested with good condition disk, case and cover art as pictured. Lot of  Nintendo 3DS Games; Mario Kart 7 + Super Mario 3D land + 3 more ! Up for sale this (5) 3DS game lot: Mario kart 7, super Mario land, Mario and Sonic at the london 2012 olympic games, the amazing spider man and pilotwings resort. Only the cartridges no manual and no case. What you see in pictures is what you will receive. If you have any questions please ask before you buy as sale is final thank you, ***FREE SHIPPING ****FREE SHIPPING I only accept PayPal and your item will ship as soon as your payment clears, via USPS free of charge to you. 3 NINTENDO 3DS Mario Games Lot (Mario Party,Luigi’s Mansion,Mario And Luigi). Condition is Very Good. Shipped with USPS Priority Mail. You will get 1 from the A pile and 1 from the B pile. Lot of 10 Nintendo 3DS Games (Mario, Pokemon, Zelda & Project X Zone 2). Condition is Like New. Shipped with USPS First Class Package. EUC The LEGO Movie & Angry Birds Trilogy Nintendo 3DS Games Lot Bundle COMPLETE! Rated E - Everyone & E10 (Everyone 10 ). There are 19 episodes, each with an exclusive new level that will keep you interested and ready for more. Angry Birds Trilogy is also. The fate of the LEGO world lies in your hands! Nickelodeon Teenage Mutant Ninja Turtles. - Batman Arkham Origins Blackgate. - The Amazing Spider Man. LEGO Star Wars, the Complete Saga. Ocarina A Link Between Worlds Majora's Mask (3DS). Lot of 3 3DS games & 1 DS Pokemon Ultra Sun, Pokemon Moon , Pokemon X , Ranger. All Cartridge only. Tested and working great. In nice condition. Quickly Shipped with USPS First Class Package. The Lot is in USED condition. Expect Normal signs of wear. Zelda link betweenworlds. Donkey kong 3ds. Kirby triple deluxe. Super Smash Bros Mario Kart 7 (3DS). Nintendo 3DS Game lot. Condition is Good. Shipped with USPS First Class Package. Super Mario 3D Land New Super Mario Bros. 2 (Nintendo 3DS LOT) Carts Only. Condition is Good and tested working. Shipped free with USPS First Class Package. You will receive the exact cases that are shown. They are in excellent condition. Swap Force and Spyro's Adventure have missing manuals. Swap Force. 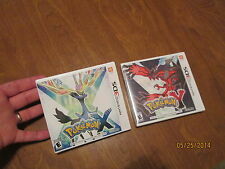 Pokemon X + Pokemon Y + Pokemon Omega Ruby 3DS Lot BRAND NEW FACTORY SEALED!